To be honest, I didn’t know a lot about the Falklands before I went there. I was on board the Ocean Adventurer for an in depth exploration of the Falklands and South Georgia, and it was South Georgia that I thought would provide the highlights. Wildlife! King penguins! Shackleton! When I thought about the Falklands I imagined visiting the capital, Stanley, maybe learning more about the 1982 war, and hopefully seeing a penguin or two. What I didn’t expect was to fall a little in love with the wildlife highlights and fascinating character of the islands and their settlements. 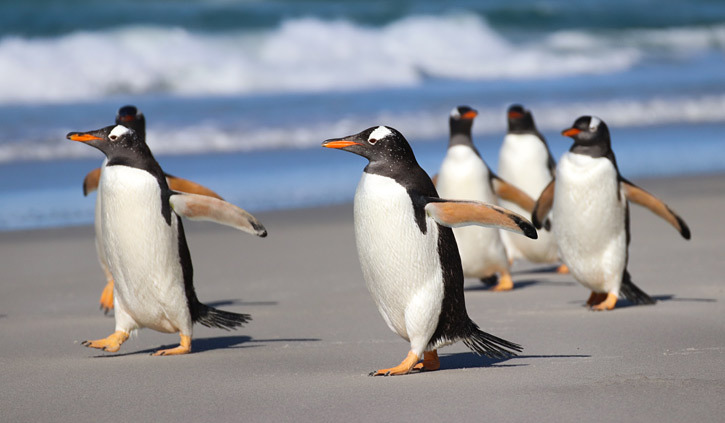 On the first afternoon in the Falklands, I stepped out of the Zodiac and into the shallow surf on Saunders Island, towards groups of Gentoo penguins scattered along the beach under a perfect blue sky. Some were waddling carefully among pebbles and onto the sand, others were grooming, and a few were flopped down on their fronts, snoozing in the sun. What a welcome! 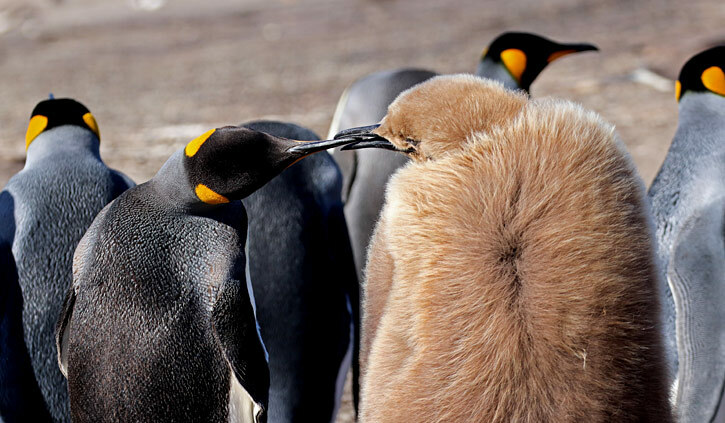 I walked across the narrow isthmus and around a bend to find my very first king penguins. They’re so tall! The adults are around 80 cm high and have striking yellow patches on their heads and chests. A couple of brown fluffy king babies were there too, although they were more like teenagers, with their brown fluffy down disappearing as the waterproof adult feathers came through. I watched as one demanded a feed from a parent, tweeting insistently until the adult couldn’t pretend not to hear anymore. Continuing to the beach on the other side of ‘The Neck’, I encountered yet another penguin species! 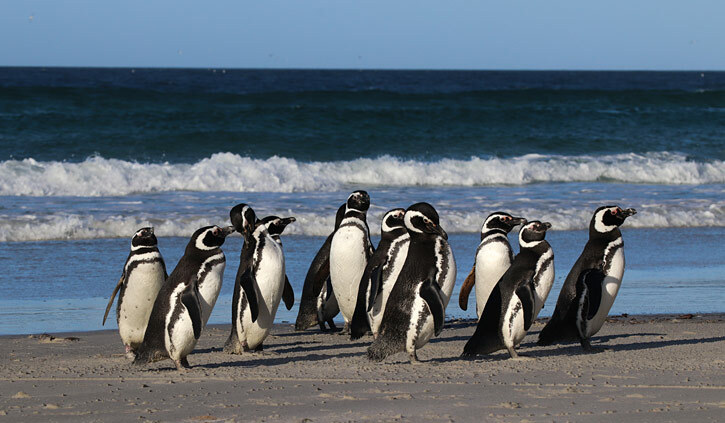 Black and white Magellanic penguins emerged tentatively from the waves, waiting near the water to form a group before heading together across the sand and into the grass to their burrows. The magic of the Falklands kept coming as I walked to the steep rocky slope at the end of the beach. 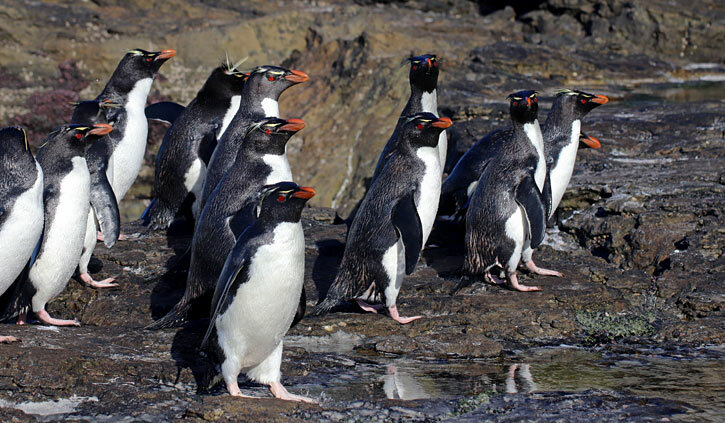 Hopping onto the rocks were my favourite penguins of all – rockhoppers. So aptly named. They really do jump from rock to rock, despite their small size, using their large feet and claws for balance. Every so often another rockhopper would pop out of the water and groom itself until its yellow crests stood up like mad scientist eyebrows, before continuing on up the cliff or jumping back into a rockpool for more swimming time. I was lucky to spend 3 days in the Falklands, exploring a range of sites in both the west and east. I learned more about Falklands history, and had the opportunity to speak with island caretakers about life on their remote farms (while enjoying the extensive afternoon teas they put on for visitors). But best of all was discovering the incredible range of wildlife that visitors can enjoy on these islands. 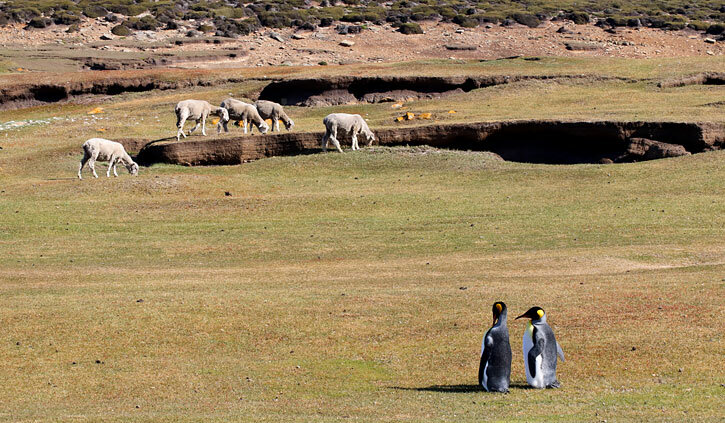 So when you’re thinking about the route for your Antarctic adventure, consider that travelling via South Georgia will not only give you a chance to explore that unique island, but may also allow you to discover the remarkable and underestimated Falklands. They are well worth the trip!